For the past 28 years, Alert Protective Services has been Chicago’s premier, locally owned and operated source for business alarm systems and home monitoring systems. Since opening in 1982, they have been providing unparalleled service to thousands of Chicago-area homes and businesses. Since APS is solely Chicago based, its owners, operators, and installers all live within the area, so customers don’t have to worry about out-of-town-management or monitoring. APS has always been there for their customers when they need them. Your family’s safety is their top priority. They provide the best service and support available. Being family owned and operated, Alert Protective Services protects your family with the same high level of protection that they use in their own homes. The professional at APS have excellent credentials and are fully licensed by the state any many other professional associations. Residents of Lombard can expect the same high level of satisfaction, as all of Alert Protective Services customers do. Alert Protective Services is highly licensed and equip to handle all of your home security needs and concerns. With APS, residents of Lombard are entitled to 24 hour-a-day service and support on all their products. Lombard or “The Lilac Village” is a suburb located west of downtown Chicago in DuPage County. It has a population of 42,322 residents and 16,487 different households. Lombard is a very diverse town with strong traditions. The median household income in Lombard is $60,015 and the average home value is $170,245. Residents of Lombard are well aware of the crime that their village experiences and in recent years, the number of thefts and burglaries has been steadily rising. Last year, there was an average of 123 crimes committed per square mile in Lombard. This is higher than the Illinois average of 104 and more than twice the national average of 49.6. Specifically, last year, a total of 1,201 crimes were reported in Lombard. 1,148 of which were property theft or burglary and only 53 were violent crimes. 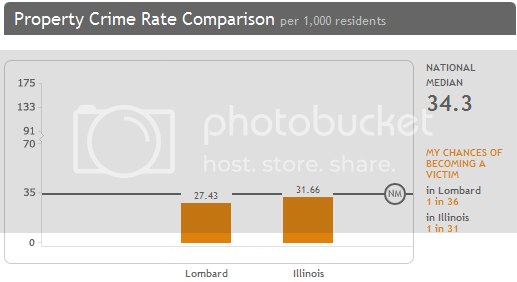 As a resident of Lombard, you should be aware that you stand a 1 in 36 chance of being a victim of a theft or burglary and only a 1 in 789 chance of being involved in a violent crime. You can see that although far more severe, violent crimes affect far less people and occur less often. An easy way to protect yourself and your home from these threats is to have a professional from APS come out and identify your home security problems and needs. All homes should have some form of home monitoring equipment in place and most insurance policies offer discounts to those households who do. Recently, the FBI conducted a study and found that if you have a home security system, you are 15 times less likely to be burglarized. Our security and monitoring systems are designed to ensure the personal safety of you and your family, and to guarantee the protection of your business from vandalism and burglary. Home security systems are a great way to safeguard your loved ones. Office security systems are an excellent means to protect your inventory and the cost of replacing expensive business equipment. Knowing the kind of monitoring system can be a difficult decision which is best left to the Alert Protective Services professionals. Our consultants have extensive knowledge of the different types of home and office security systems available, and which types will best meet your specific needs. Give us a call and let the experts at APS help you decide which of our products is best for you.